Over the last century, astronomy and space science have changed our understanding of the evolution of the universe. Nevertheless, our view is still incomplete in the frequency range below 30 MHz, which is one of the unexplored frequency bands in radio astronomy. Observations from Earth become impossible below ~10 MHz due to the ionosphere’s opacity and the presence of strong man-made radio interference. Deploying an interferometric radio instrument in space is therefore the only way to open up this unique observing window to the universe. This paper presents the long-term plan envisioned by ISIS, Astron, the Radboud Radio Lab, TU Delft, the University of Twente and their partners in the Netherlands and in the world to deploy the next generation of radio-astronomy instrument based on network of nanosatellites. The concept of the instrument to be used is currently being refined in order to fly on the joint Netherland-China Long-wavelength Explorer (NCLE) mission that will fly aboard the Chang’e-4 Satellite in 2018. This ambitious project will demonstrate the performance of a first prototype of the instrument. The second step is to conduct the feasibility assessment of nano-satellites or nano-satellite constellations able to operate in orbit around the Moon. 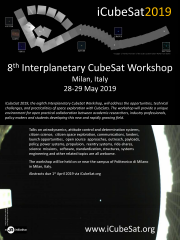 CLE (Cubesat Low frequency Explorer) aims at developing a concept for a trio of CubeSats that jointly perform an interferometric radio-astronomy mission. The lessons learned from NCLE will allow for improvements of the instrument, and its miniaturization will allow its use in smaller spacecraft. Further on the horizon, OLFAR (Orbital Low Frequency ARray) aims to design a low-frequency distributed radio telescope in space. The concept uses a large constellation of small spacecraft in orbit around the Moon, and could end up in an S-class or M-class science mission. This ambitious mission, built upon the NCLE and CLE projects, will eventually enable new scientific achievement and help improving our understanding of the Universe. The paper focuses on the technology roadmap needed to achieve the next steps towards OLFAR. It provides an overview of past and present work and elaborates on the chosen approach of incremental ‘stepping-stone’ mission to achieve the end goals. System drivers are identified, discussed and possible solutions are described in order to achieve a working distributed radio astronomy infrastructure in lunar orbit within the next decade. This includes an overview of new technologies, collaborations, and launch opportunities to lunar orbit in order to accelerate (lunar) exploration missions using CubeSats.